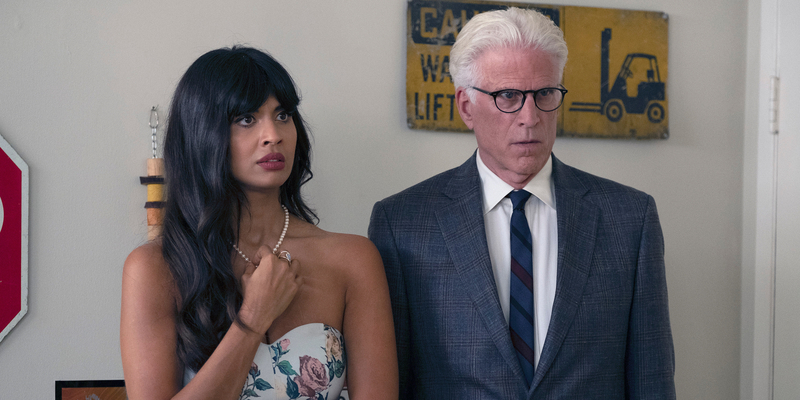 There are two specific things that The Good Place creator Mike Schur promises viewers will never see in the Bad Place, and he has very good reasons for those omissions. NBC’s afterlife comedy is well into its third season, and though Eleanor, Chidi, Tahani, and Jason are back on Earth, the Bad Place is just a conveniently placed inter-dimensional door away, making the threat of spending an eternity there a little more real for the foursome. But even though the show paints an unpleasant picture of its version of hell, that doesn’t mean it has any plans to illustrate just how bad it could be for viewers. To that end, Schur and his writers’ room have a few specific rules about what does and does not go on in the Bad Place — at least on screen. Though the series has made mention of a few specific forms of hellish torture, it has approached actual depictions of the Bad Place with humor. That is, even though the show is dealing with demons intent on making things as unpleasant as possible for humans deemed bad enough to be sent to them, The Good Place has no intention of going full Clive Barker. At the Vulture festival in Los Angeles, Schur discussed the show’s depiction of hell and stressed that not only does the show want to approach that corner of the afterlife with a sense of humor, but it also has two hard and fast rules regarding what it will never delve into. For one, Schur says, it’s just funnier to think of hell as being filled with toxic men and other obnoxious people. As the saying goes, “Hell is other people.” And as far as The Good Place writers are concerned, it’s funnier to focus on the folks who’re obnoxious rather than straight out evil. The Good Place continues Thursday, December 6 with ‘Janet(s)’ @8:30pm on NBC.